Children of all ages enjoy the Children’s Barnyard petting zoo. I was shocked to discover that a friend has never seen the huge pig or attended a dog show at the State Fair of Texas! She and her 7-year-old daughter spend their time on the Midway, enjoying an entirely different Fair experience filled with rides, carnival games and cotton candy. Not surprisingly, my Fair outings focus primarily on the animals. Historically, state fairs originally emphasized agriculture and livestock. The idea to hold a state fair is attributed to Elkanah Watson, a wealthy New England farmer who showcased his sheep in the public square in Pittsfield, Mass. in 1807. The first state fair was held in 1841 in Syracuse, N.Y., where 10,000 – 15,000 people viewed animal exhibits, a plowing contest and samples of manufactured goods for the home. 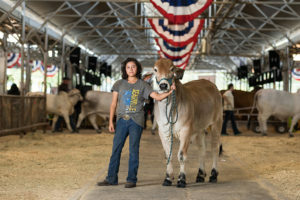 Livestock judging at state fairs dates back to the 19th century. Although corny dogs and fried whatsit came later, state fairs have always centered around the production and enjoyment of food, featuring recipe judging and vegetable-growing contests. Butter sculptures, introduced by the dairy industry to promote their product, began in 1903. Wild West Pet Palooza This humorous, highly entertaining show stars animals that have been rescued from animal shelters across the country. The skits have been the same the past couple of years, but I still love watching the choreographed interactions of the dogs, cats, birds and other animals. I schedule this show on my personal “Fair planner” first, to be sure I don’t miss it. Majesty of the Horse Jerry Diaz, his wife and teenage son demonstrate incredible horsemanship feats. Even if you’re not a horse person, this show is worth watching to take in the beauty and grace of these majestic creatures. I enjoy witnessing Jerry interact patiently and supportively when his son struggles with a particular skill in front of the audience. Mr. Diaz displays parenting at its best. I’m a little too old for a petting zoo, but it’s awfully cute seeing the children interact with the adorable farm animals. 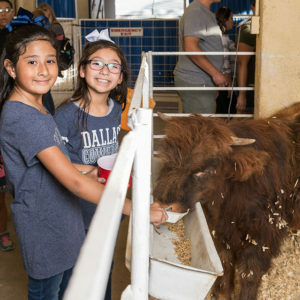 New this year, the Children’s Barnyard petting zoo and Little Hands on the Farm (farm to market activity for kids) have been combined and moved inside the coliseum. You can linger longer in air-conditioned comfort. This pig is so enormous that I don’t know if it can even stand up. Stroll by and check it out on your way to the barns. I would say “only in Texas,” but I bet a few other states also boast world-record-contender pigs. Every year more than 5200 students participate in the youth livestock events and leadership contests. Livestock exhibitors show more than 15 breeds of cattle, nine breeds of sheep, rabbits and llamas. Although I’ve never caught a livestock show, I do stroll through the barns to watch the kids grooming their animals and cleaning their stalls. The goats wear little coats like a mini horse blanket — probably the only way to keep the little darlings clean. This new event is one I am looking forward to checking out. Performances by these talented dogs, who have all been rescued from animal shelters, should be fun! Featured on the Ellen Degeneres show, these clever canines show off their talents at skilled activities such as juggling, jumping rope and barrel racing. My perfect day at the fair includes all these shows and activities, combined with a peek at the butter sculpture and photography contest winners in the Fine Arts building. The Zuzu African Acrobats and Vocal Trash round out my agenda. Whatever your ideal State Fair day includes, you’re practically guaranteed to have fabulous people-watching and a ton of fun! Take me out to the State Fair of Texas!